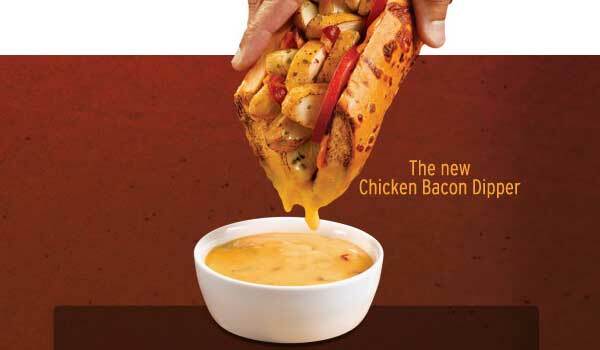 Sandwich juggernaut Quiznos recently introduced an interesting new concept sandwich, the Chicken Bacon Dipper. The general thrust of it is that you get a rather ordinary chicken sub with a side of cheese dipping sauce to dip it in. Does it forever change the world of franchise sandwiches? Let’s find out!! SPOILER ALERT: It really doesn't. The sub itself is fine, if unremarkable. It’s got chicken, bacon, tomatoes, and according to the website can be made with some kind of Chitpotle Jack bread. My local Quiznos didn’t have it, so I went with Italian instead. It’s good, but it’s not a limited time offer hook without the dipping sauce. The sauce, incidentally, was my biggest disappointment with the sandwich. The consistency of it was all wrong, it was really much more of a spread than a sauce. Throwing it in a microwave or something might have helped it melt a little bit, but that’s not my responsibility. The “sauce” was cheesy and a little too spicy, and was kind of hard to dip into. It would’ve worked much better if it’d been more like the nacho cheese or salsa con queso you can buy at a grocery store. All in all, it’s a decent experiment, but the execution left a lot to be desired. I’m not opposed to the idea of a dipping sandwich. The precedent is there (see French Dip sandwich for more details), and a simple sandwich you could dip in a cheese or BBQ or ranch sauce could be great. Quiznos just isn’t quite there yet. That said, they do have a coupon on their website for the sub, so it’s a pretty good deal. And who knows, maybe the poor dip consistency is a localized problem (although looking at pictures online, I kind of doubt it). Having read your review, my fiance’ is a manager of a Quiznos, she fiddled around with the cheese sauce and changed it to be a bit creamier instead of trying to dip a sandwich into cake frosting. Came out pretty good. Just let your local quiznos know that you want them to water it down just a tad. Glad to hear it! It’s a neat concept, and could really work with the proper execution. Not sure if it was a localized issue or not. They may not have been heating the cheese properly. This was a fav of many of our customers, including my six-year old son; who still asks about the cheese dipper sandwich. The consistency should have been more like a salsa con queso, in fact salsa con queso is basically what the cheese was, made with real cheddar cheeses. Wish they’d bring it back, although when I made the sandwich; I just took the cheese and dumped it on the inside of it. Made it a whole lot easier to taste.